54. Nearns. E.H. & I.P. Swift. [in prep] A new species of Periergates Lacordaire, 1872 (Cerambycidae: Lamiinae: Onciderini) from Costa Rica, with description of immature life stages and notes on biology. 53. Nearns. E.H. & I.P. Swift. [in prep] Three new species of longhorned beetles (Coleoptera: Cerambycidae) from Central and South America. 52. Casari, S.A., Nascimento, F.E. de L., Nearns, E.H., & A. Santos-Silva. [in prep] Onciderini Thomson, 1860 (Coleoptera: Cerambycidae: Lamiinae) types of the Museu de Zoologia, Universidade de São Paulo (MZSP), with a brief history of the Coleoptera collection. 51. Nearns. E.H. [in press] A new genus and species of Onciderini Thomson, 1860 (Coleoptera: Cerambycidae: Lamiinae) from Ecuador, with notes on additional taxa. 50. Nearns. E.H. & M.A. Monné. [in press] Two new South American species of Neocherentes Tippmann, 1960 (Coleoptera: Cerambycidae: Lamiinae: Onciderini). Insecta Mundi. 48. Nearns, E.H. & F.E. de L. Nascimento. 2019. A new genus and seven new species of Onciderini Thomson, 1860 (Coleoptera, Cerambycidae, Lamiinae) from Central and South America. Insecta Mundi, 0688: 1–16. 47. Prathapan, K.D., Pethiyagoda, R., Bawa, K.S., Raven, P.H., Rajan, P.D. & 172 co-signatories from 35 countries [including Nearns, E.H.] 2018. When the cure kills - CBD limits biodiversity research. Science, 360(6396): 1405–1406. 42. Nearns, E.H. & G.L. Tavakilian. 2015. Seven new species of Oncideres Lacordaire, 1830 (Coleoptera: Cerambycidae: Lamiinae: Onciderini) from South America, with notes on additional taxa. Arquivos de Zoologia, 46(7): 87–113. 41. Bezark, L.G., Botero, J.P., Galileo, M.H.M., Lingafelter, S.W., Monné, M.L., Monné, M.A., Morris, R.F., Napp, D.S., Nearns, E.H., Santos-Silva, A., Skillman, F.W., Tavakilian, G.L., Thomas, M.C., & J.E. Wappes. 2015. A new species of Eclipta Bates, 1873 from Brazil (Coleoptera, Cerambycidae) in honor of the late Ubirajara Ribeiro Martins de Souza. Arquivos de Zoologia, 46(3): 65–73. 39. Tavakilian, G.L. & E.H. Nearns. 2014. New nomenclatural changes for 2014: II. Corrigendum & Addenda (Coleoptera, Cerambycidae). Les Cahiers Magellanes (NS), 16: 157–158. 36. Tavakilian, G.L. & E.H. Nearns. 2014. New nomenclatural changes for 2014: I. The genus Rhytiphora Audinet-Serville, 1835 (Coleoptera, Cerambycidae, Lamiinae). Les Cahiers Magellanes (NS), 15: 99–108. 34. Santos-Silva, A., Komiya, Z., & E.H. Nearns. 2013. Revision of the genus Prionacalus White, 1845 (Coleoptera: Cerambycidae: Prioninae: Prionini). The Coleopterists Bulletin, 67(3): 201–240. 33. Lingafelter, S.W. & E.H. Nearns. 2013. Elucidating Article 45.6 of the International Code of Zoological Nomenclature: A dichotomous key for the determination of subspecific or infrasubspecific rank. Zootaxa, 3709(6): 597–600. 32. Nearns, E.H. & R.A. Androw. 2013. Onciderini Thomson, 1860 (Coleoptera: Cerambycidae: Lamiinae) holotypes of the Carnegie Museum of Natural History (CMNH), with a brief history of the Coleoptera collection. Insecta Mundi, 0316: 1–13. 31. Lingafelter, S.W., Garzón-Moreno, A., & E.H. Nearns. 2013. Primary types of Chinese longhorned woodboring beetles (Coleoptera: Cerambycidae and Disteniidae) of the Smithsonian Institution. Pp. 117–146. In: Lin, M.-Y. & Chen, C.-C. (eds.). In memory of Mr. Wenhsin Lin. Formosa Ecological Company, Taiwan. 233 pp. 30. Nearns, E.H. & G.L. Tavakilian. 2012b. A new genus and five new species of Onciderini Thomson, 1860 (Coleoptera: Cerambycidae: Lamiinae) from South America, with notes on additional taxa. Insecta Mundi, 0266: 1–23. 29. Nearns, E.H. & G.L. Tavakilian. 2012a. New taxa and combinations in Onciderini Thomson, 1860 (Coleoptera: Cerambycidae: Lamiinae) from Central and South America, with notes on additional taxa. Insecta Mundi, 0231: 1–24. 28. Monné, M.A., Nearns, E.H., Carbonel Carril, S.C., Swift, I.P., & M.L. Monné. 2012. Preliminary checklist of the Cerambycidae, Disteniidae, and Vesperidae (Coleoptera) of Peru. Insecta Mundi, 0213: 1–48. 27. Nearns, E.H. & I.P Swift. 2011. New taxa and combinations in Onciderini Thomson, 1860 (Coleoptera: Cerambycidae: Lamiinae). Insecta Mundi, 0192: 1–27. 26. Lingafelter, S.W. & E.H. Nearns. 2011. New synonymy in Cuban Tilloclytus Bates (Coleoptera: Cerambycidae: Anaglyptini). The Coleopterists Society, 65(2): 153. 23. Maes, J.-M., Berghe, E., Dauber, D., Audureau, A., Nearns, E.H., Skillman, F., Heffern, D., & M.A. Monné, M.A. 2010. Catalogo ilustrado de los Cerambycidae (Coleoptera) de Nicaragua. Partes I–V. Revista Nicaraguense de Entomologia, 70: (Sup. 1), 1–102, 1–640, 1–31, 1–879, 1–422. 21. Swift, I.P., Santos-Silva, A., & E.H. Nearns. 2010. The genus Trichocnemis LeConte, 1851 (Coleoptera, Cerambycidae, Prioninae). ZooKeys, 61: 33–46. 20. Swift, I.P., Bezark, L.G., Nearns, E.H., Solís, A., & F.T. Hovore. 2010. Checklist of the Cerambycidae (Coleoptera) of Costa Rica. Insecta Mundi, 0131: 1–68. 19. Bousquet, Y., Heffern, D.J., Bouchard, P., & E.H. Nearns. 2009. Catalogue of family-group names in Cerambycidae (Coleoptera). Zootaxa, 2321: 1–80. 18. Nearns, E.H., Swift, I.P., & L.J. Joly. 2009. First record of Curius chemsaki Nearns & Ray, 2006 (Coleoptera: Cerambycidae: Cerambycinae: Curiini) in Colombia. Insecta Mundi, 0103: 1–2. 17. Nearns, E.H. & K.B. Miller. 2009. A new species of Plectromerus Haldeman from Central America and description of the female of Plectromerus dezayasi Nearns & Branham, 2008 (Coleoptera: Cerambycidae: Cerambycinae: Plectromerini). ZooKeys, 24: 55–62. 16. Wappes, J.E., Ledezma Arias, J., & E.H. Nearns. 2009. List of Coleoptera Holotypes in Museo de Historia Natural Noel Kempff Mercado, Universidad Autónoma "Gabriel René Moreno," Santa Cruz de la Sierra, Bolivia. Insecta Mundi, 0081: 1–8. 15. Thomas, M.C. & E.H. Nearns. 2008. A new genus of telephanine Silvanidae (Coleoptera: Cucujoidea), with a diagnosis of the tribe and key to the genera. Insecta Mundi, 0048: 1–14. 14. Nearns, E.H. 2008. Description of the male of Plectromerus michelii Nearns & Branham, 2008 (Coleoptera: Cerambycidae). Insecta Mundi, 0038: 1–2. 12. Lingafelter, S.W. & E.H. Nearns. 2007. Five new species of longhorned beetles (Coleoptera: Cerambycidae) from Dominican Republic in genera Ataxia Haldeman, 1845; Atimiola Bates, 1880; Drycothaea Thomson, 1868; Eburia Lepeletier and Audinet-Serville, 1830; and Hormathus Gahan, 1830. The Coleopterists Bulletin, 61(2): 177–191. 11. Woodley, N.E. & E.H. Nearns. 2007. The type material of Buprestidae (Coleoptera) in the Fernando de Zayas collection, Havana, Cuba. The Coleopterists Bulletin, 61(3): 334–338. 10. Lingafelter, S.W. & E.H. Nearns. 2006. Rediscovery and redescription of the remarkable Phoenicus sanguinipennis Lacordaire (Coleoptera: Cerambycidae: Trachyderini) from the Dominican Republic. The Coleopterists Bulletin, 60(3): 199–206. 9. Nearns, E.H. 2006. A checklist of the Cerambycidae (Coleoptera) holdings of the Fernando de Zayas Collection, Havana, Cuba. The Coleopterists Bulletin, 60(1): 53–57. 8. Nearns, E.H., Branham, M.A., & S.M. Bybee. 2006. Cerambycidae (Coleoptera) types of the Fernando de Zayas Collection, Havana, Cuba. Zootaxa, 1270: 1–17. 7. Nearns, E.H. & A.M. Ray. 2006. A new species of Curius Newman (Coleoptera: Cerambycidae) from Venezuela with notes on sexual dimorphism in the genus. Zootaxa, 1256: 49–57. 6. Nearns, E.H. & W.E. Steiner. 2006. A new species of Plectromerus Haldeman (Coleoptera: Cerambycidae) from Navassa Island, Greater Antilles. Zootaxa, 1163: 61–68. 5. Wappes, J.E., Morris, R.F., Nearns, E.H., & M.C. Thomas. 2006. Preliminary checklist of Bolivian Cerambycidae (Coleoptera). Insecta Mundi, 20(1–2): 1–45. 4. Micheli, C.J. & E.H. Nearns. 2005. Two new species of Plectromerus Haldeman (Coleoptera: Cerambycidae) from the West Indies. Zootaxa, 1028: 23–36. 3. Nearns, E.H. & M.A. Branham. 2005. A new species of Plectromerus Haldeman (Coleoptera: Cerambycidae) from Dominican amber with notes on the fossil Plectromerus tertiarius Vitali. Zootaxa, 1088: 17–24. 2. Nearns, E.H., Branham, M.A., Rodriguez, N.G., & I.F. Garcia. 2005. Curius punctatus (Fisher), new combination (Coleoptera: Cerambycidae: Curiini). Insecta Mundi, 19(3): 172. 1. Nearns, E.H. & R.H. Turnbow. 2005. First record of Plectromerus exis Zayas in the Dominican Republic (Coleoptera: Cerambycidae). Insecta Mundi, 19(3): 158. 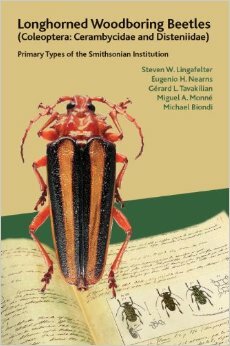 Nearns, E.H. [in press] Book review: Photographic Guide to Longhorned Beetles of Bolivia. Quarterly Review of Biology. Nearns, E.H. & G.L. Tavakilian. 2014. Book review: Australian Longhorn Beetles (Coleoptera: Cerambycidae). Volume 1: Introduction and Subfamily Lamiinae. Systematic Entomology. Nearns, E.H. 2008. Book review: Les Longicornes des Petites Antilles (Coleoptera, Cerambycidae): Taxonomie, Ethologie, Biogeographie. The Coleopterists Bulletin, 62(4):544. Nearns, E.H. Scarabs intercepted by APHIS at US ports of entry. SOLA scarabs symposium, ESA Annual Meeting, St. Louis, MO, scheduled for 17 Nov. 2019. Invited speaker (declined due to schedule conflict), Department of Entomology seminar series, Texas A&M University, College Station, TX, Fall 2017. 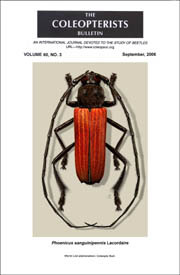 Nearns, E.H. My work in Coleoptera systematics. Interview presentation for Entomologist, National Identification Services, USDA/APHIS/PPQ, Riverdale, MD, 19 Jun. 2017. Nearns, E.H. My vision for the insect collection and how this supports delivery of the Science Strategy. Principal Curator in Charge, Division of Insects, interview presentation, Natural History Museum, London, UK, 29 Nov. 2016. Nearns, E.H., Lord, N.P., Lingafelter, S.W., Santos-Silva, A., & K.B. Miller. Developing Longicorn ID: Tool for diagnosing cerambycoid beetles. SysEB Section Symposium: Interactive Keys Transforming Identification. Entomological Society of America (ESA) Annual Meeting, Austin, TX, 13 Nov. 2013. Nearns, E.H., Brady, S., Swift, I.P., Grzymala, T.L., Jean, A., & K.B. Miller. Molecular phylogenetic analysis of the longhorned beetle subfamilies Prioninae and Parandrinae (Insecta: Coleoptera: Cerambycidae). 6th Dresden Meeting on Insect Phylogeny. Dresden, Germany, 28 Sep. 2013. Nearns, E.H. & K.B. Miller. Preliminary findings into the morphology and systematics of Onciderini (Cerambycidae: Lamiinae). Symposium: Systematics, Biology, and Ecology of Cerambycidae and Buprestidae, International Congress of Entomology (ICE 2012), Daegu, Korea, 20 Aug. 2012. Nearns, E.H., Lord, N.P., & K.B. Miller. Design and development of web-based identification tools for wood boring beetles: a case study. USDA APHIS PPQ CPHST Fort Collins Laboratory, CO, 20 Mar. 2012. Nearns, E.H., Lord, N.P., & K.B. Miller. Design and development of web-based identification tools for wood boring beetles: a case study. Web-Based Digital Insect Identification: Our Progress, Challenges, and Opportunities. Entomological Society of America (ESA) Annual Meeting, Reno, NV, 15 Nov. 2011. Nearns, E.H. & K.B. Miller. Preliminary findings into the morphology and systematics of Onciderini (Cerambycidae: Lamiinae). Hardly Boring: Cerambycid Workers Symposium. Entomological Society of America (ESA) Annual Meeting, Reno, NV, 13 Nov. 2011. Nearns, E.H. Preliminary findings into the morphology and systematics of Curiini (Coleoptera: Cerambycidae). Symposium on the Systematics and Faunistics of Cerambycidae, U.S. National Museum, Smithsonian Institution, Washington, D.C., 10 Nov. 2005. Nearns, E.H. On the morphology of male genitalia in Onciderini (Coleoptera: Cerambycidae: Lamiinae). Symposium: Systematics, Biogeography, and Ecology of Cerambycidae and Buprestidae. XXVI International Congress of Entomology (ICE 2020), Helsinki, Finland, scheduled for July 2020. Nearns, E.H. & I.P. Swift. A new species of Periergates Lacordaire, 1872 (Cerambycidae: Lamiinae: Onciderini) from Costa Rica, with description of all life stages and notes on biology. Immature Beetles Meeting, Prague, Czech Republic, scheduled for Oct. 2019. Nearns, E.H. Current projects in Cerambycidae (Coleoptera). Systematics, Biogeography, and Ecology of Cerambycidae and Buprestidae symposium. Annual Meeting of the ESA, Vancouver, Canada, 11 Nov. 2018. Branham, M.A., Keller, O., & E.H. Nearns. Lampyrids.com - Lampyridae Primary Types of World Website. ESA Annual Meeting, Denver, CO, 8 Nov. 2017. Jacobus, L.M., Nearns, E.H., & J.M. Zaspel. Purdue Entomological Research Collection resources supporting freshwater science, Society for Freshwater Science Annual Meeting, Raleigh, N.C. 7 Jun. 2017. Jacobus, L., Zaspel, J.M., & E.H. Nearns. Research resources from the Purdue Entomological Research Collection. Indiana Academy of Sciences 132nd Annual Meeting, Indianapolis, IN. 25 Mar. 2017. Zaspel, J.M., Klem, C., Anderson, T.J., Nearns, E.H., & L. Harshbarger. Purdue Entomological Research Collection (PERC). InvertNet Workshop, Carnegie Museum of Natural History, Pittsburg, PA. 9 Mar. 2017. Nearns, E.H., Lord, N.P., Lingafelter, S.W., Santos-Silva, A., Miller, K.B., & J.M. Zaspel. Longicorn ID: a tool for identification of larval Cerambycidae. Symposium: Systematics, Biogeography, and Ecology of Cerambycidae and Buprestidae. International Congress of Entomology (ICE 2016), Orlando, FL, 26 Sep. 2016. Kula, R.R., Lill, J.T., Nearns, E.H., & H.J. Dalgleish. Acquisition, management, and analysis of historical and contemporary data to discern legacy effects of ecological extinction on insect biodiversity. International Congress of Entomology (ICE 2016), Orlando, FL, 26 Sep. 2016. Zaspel, J.M., Purcell, C., Anderson, T.A., Nearns, E.H., & L. Harshbarger. BoilerBug: A networked science collaboration between the Purdue Entomological Research Collection (PERC) and the Logansport Indiana Youth Correctional Facility (LIYCF). Entomological Collections Network (ECN) Annual Meeting, Orlando, FL, 24 Sep. 2016. Powell, G.S., Snyder, J.L., Anderson, T.J., Nearns, E.H., & J.M. Zaspel. The Purdue Entomological Research Collection with Comments on the Lepidoptera Holdings. The 65th Annual Meeting of The Lepidopterists' Society Florissant, CO, 9 Jul. 2016. Nearns, E.H., Swift, I.P., Powell, G.S., & J.M. Zaspel. Developing a long-term study in Costa Rica. Entomological Collections Network (ECN) Annual Meeting, Minneaoplis, MN, 14 Nov. 2015. Nearns, E.H., Powell, G.S., & J.M. Zaspel. Rehabilitation and revitalization of the Purdue Entomological Research Collection (PERC). Entomological Collections Network (ECN) Annual Meeting, Portland, OR, 16 Nov. 2014. Nearns, E.H., Gates, M.W., Buffington, M.L., & K. Schulz. Proceedings of the ESW: modernization of a century-old scientific journal. Entomological Collections Network (ECN) Annual Meeting, Austin, TX, 10 Nov. 2013. 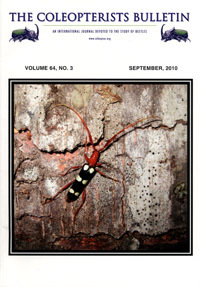 Nearns, E.H. Systematics of longhorned beetles (Insecta: Coleoptera: Cerambycidae). Dissertation defense seminar, Department of Biology, Museum of Southwestern Biology, University of New Mexico, Albuquerque, NM, 2 Nov. 2012. Nearns, E.H., Swift, I.P., Slipi&nacute;ski, A., Cameron, S., & K.B. Miller. Molecular phylogenetic analysis of Parandrinae and Prioninae (Coleoptera: Cerambycidae) of the world. Ten-Minute Papers, SysEB: Systematics. Entomological Society of America (ESA) Annual Meeting, San Diego, CA, 14 Dec. 2010. Nearns, E.H., Lord, N.P., & K.B. Miller. Systematics in the 21st Century - Developing Lucid Keys to Enhance Taxonomy. Entomological Collections Network (ECN) Annual Meeting, San Diego, CA, 11 Dec. 2010. Nearns, E.H., Miller, K.B., Swift, I.P, Grzymala, T.L., & A.J. Tafoya. On the longhorned beetles of the world: a phylogeny based on molecular data. Student Competition Presentation; Southwestern Branch (SWB) of the Entomological Society of America (ESA) Annual Meeting, Stillwater, OK, 24 Feb. 2009. Tafoya, A.J, Nearns, E.H., & K.B. Miller. On predacious diving beetles (Dytiscidae): Phylogenetic analysis of relationships among members of the genera Hygrotus Stephens and Coelambus Thomson using molecular data. Student Competition Presentation; SysEB: Systematics. Entomological Society of America (ESA) Annual Meeting, Indianapolis, IN, 14 Dec. 2009. Nearns, E.H. & M.A. Branham. Biogeography of two genera of longhorned beetles occurring in the Caribbean. Student Competition Poster, SysEB: Systematics. Entomological Society of America (ESA) Annual Meeting, Reno, NV, 18 Nov. 2008. Nearns, E.H., Miller, K.B., Swift, I.P., Grzymala, T.L., & A.J. Tafoya. On the longhorned beetles of the world: a phylogeny based on molecular data. Student Competition Presentation; SysEB: Systematics. Entomological Society of America (ESA) Annual Meeting, Reno, NV, 17 Nov. 2008. Nearns, E.H. & K.B. Miller. A preliminary morphological study of Oncideres c. cingulata (Say) (Coleoptera: Cerambycidae: Lamiinae: Onciderini). Student Competition Poster, Department of Biology 2008 Research Day, University of New Mexico, Albuquerque, NM, 11 Apr. 2008. Nearns, E.H. & K.B. Miller. A preliminary morphological study of Oncideres c. cingulata (Say) (Coleoptera: Cerambycidae: Lamiinae: Onciderini). Student Competition Poster, Section A: Systematics, Morphology, & Evolution. Entomological Society of America (ESA) Annual Meeting, San Diego, CA, 10 Dec. 2007. Nearns, E.H. Revision and phylogeny of the tribe Curiini LeConte (Coleoptera: Cerambycidae: Cerambycinae). Ten-Minute Papers, Section A: Systematics, Morphology, & Evolution. Entomological Society of America (ESA) Annual Meeting, Indianapolis, IN, 10 Dec. 2006. Nearns, E.H. Revision and phylogeny of the tribe Curiini LeConte (Coleoptera: Cerambycidae: Cerambycinae). Thesis defense seminar, Department of Entomology & Nematology, University of Florida, Gainesville, FL, 19 Jun. 2006.